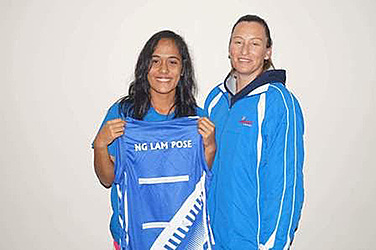 Netball Samoa is gearing up for a tremendous year. The year has just begun and netball is already training hard for their upcoming International Youth Netball Series which will take place next week. One star set to shine on stage is Romaina Pose, a young athlete who hails from the villages of Vaimoso and Moamoa. The executive and management for Netball Samoa has nominated Ms. Pose as “Breakout Star of the Year” for her outstanding performances in 2016. Ms. Pose is one of the few locally based players who will be representing Samoa in the upcoming tournament. Prior to her selection, Ms. Pose has made tremendous achievements in netball. The recent graduate from Samoa College is both excited and a bit nervous for the upcoming tournament which will lead up to the 2017 Netball Youth World Cup. The young athlete got in to the sport in Year 5, when her Aunt Rachel asked her to give netball a chance. Since that fateful day, Ms. Pose has been hooked. She began attending training and found a club to help hone her skills to reach the level of success that she is at today. Ms. Pose says her biggest inspiration is her father. The upcoming star named Silver Fern, Kayla Cullen is an athlete she looks up to for her positive attitude, skills and speed on the court.